I'm going to get straight to the point. My skin really annoys me. It goes from oily to a combination of dry and oily, to being fairly sensitive in the matter of days/weeks. So even though I have a lot of different skin care products, most of them don't work perfectly for me. So I'm always up for trying new products to see if they do work for me. So when Brodie and Stone contacted me asking if I would like to try out some of the Newtons Labs products, I definitely wasn't going to say no! Newton Labs sell natural skincare products which are made for spot prone skin. They contain Tea Tree, Salicylic Acid, Charcoal, Witch Hazel and natural microbeads. The Cleansing Cream Wash contains Tea Tree, Salicylic Acid and Eucalyptus. It's been made to deeply cleanse and unclog pores without overdrying the skin, it can also be use to remove makeup. It's also cooling and uplifting and also suitable for sensitive skin. I will admit, I found it kind of weird that the instructions read - "Apply to a dry face by gently massaging in small circles. Rinse off with lukewarm water." I don't think I've ever used a cream cleanser which says you should apply to a dry face, but there's a first time for everything. So I did as it said and my skin felt nice and fresh and it seemed to leave my skin with a slight blur effect which I liked. It's Parabens free. Also just want to add that it does smell of Tea Tree and Eucalyptus, even though it does state on the tube that it's "Fragrance-Free" but that doesn't really bother me. The Exfoliating Daily Wash contains micro-beads and antibacterial Tea Tree to effectively deep cleanser pores and helps clear spots. It's been made to gently clear pores and purify the skin, leaving it fresh and healthy looking. Also to remove oil and dead skin cells that can block pores and cause spots and get rid of hidden makeup residues and dirt for visibly clearer skin. To use this you have to wet your skin with warm water to lather it up (it does lather up well! ), then massage gently in circles and then rinse off thoroughly and pat dry. I really like this exfoliating wash, as it's gentle but you can tell it's working. I've been using both the Exfoliating Daily Wash and the Cleansing Cream Wash each day, I usually use the cream cleanser in the morning and then the daily exfoliator at night. Overall since using these cleansers, my skin is looking a lot clearer and healthier. Both of the products seem to leave a slight blur effect on my skin and make my skin feel soft, fresh and clean. Another product I received is the Spot Zapping Gel. Again it contains Tea-Tree and Witch Hazel as well as clearing Salicylic Acid to help promote healthy-looking, clear skin. After cleansing your face, you pop this on and it will reduce angry red spots and prevent any which are forming. I definitely think this started to work in the allocated time of 4 hours which it says on the tube and my spots definitely looked reduced hours after using this! These Nose Strips from Newton Labs come in a pack of 6 and are enriched with Tea Tree to help prevent spots whilst the Witch Hazel soothes and tightens pores. I do love a good nose strip! I tend to pick up mine from B&M, the pound shop or Superdrug usually. You apply these like any other nose strip and leave the strip to dry for about 10 minutes. I left mine on for about 15 minutes (oops!) and it did remove some blackheads, but I don't feel like it got all my blackheads out. Overall I do really like Newton Labs Skincare range, I'll definitely be continuing to use their products. 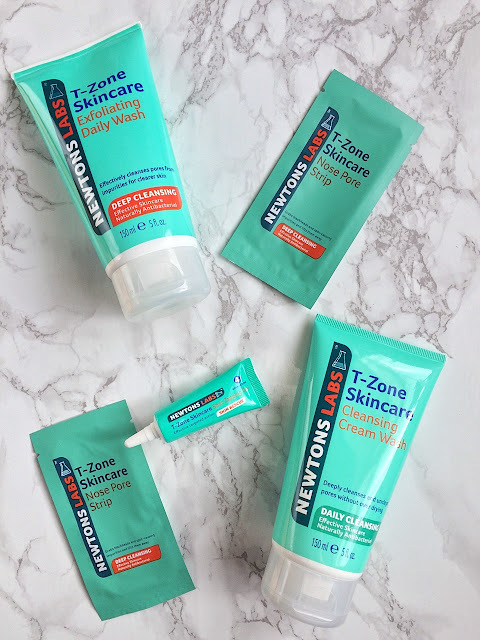 If you're interested in trying Newtons Labs skincare range then you can pick them up in Superdrug, B&M, Savers and Home Bargains and they range between £3.99 - £4.99 each. Have you or are you going to be trying out the Newtons Lab Skin Care products? These look very similar to another brand - clean and clear is it? I really need to start focusing on skincare, I get spots so much! I thought that! and T Zone maybe?